Hansgrohe > Rainmaker 1 Jet Shower Head & Arm (460mm, White & Chrome). Hansgrohe Rainmaker Select 460 rectangular shower head in white and chrome with 1 jet and wall mounting arm. 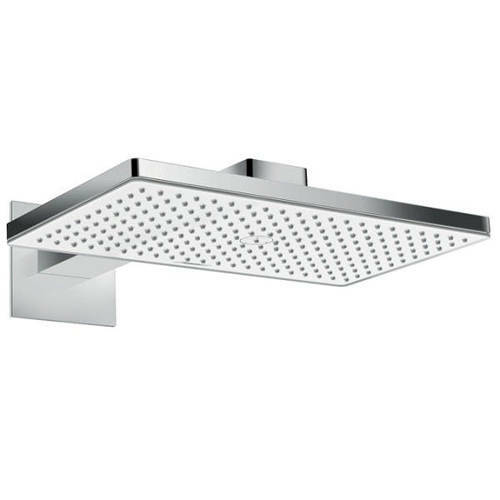 Rainmaker rectangular shower head (1 jet). Operating pressure: 1.5 bar to 6 bar maximum. Suitable for concealed shower valves with 1 outlet (sold separately). Wall mounting shower arm included (460mm). Easy installation: iBox universal basic set included. Easy cleanable glass spray disc. Flow rate: Rain 19 l/min at 3 bar. Design: RedDot award winner 2015. 5 Year guarantee: Hansgrohe guarantee their shower heads for 5 years.